Oh crumbs! The Scarifyers back for a new adventure! 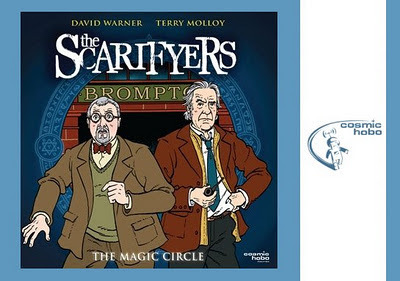 It is always a delight to discover something new, especially when it is as wonderfully scripted as The Scarifyers: The Magic Circle, an audio adventure following the exploits of Professor Dunning as he attempts to find his old friend, Inspector Lionheart. To understand a little about this audio series you must take a step back to the first five stories - in 2006 actors Nicholas Courtney and Terry Molloy were cast as Lionheart and Dunning respectively, two characters brought together to investigate mysterious happenings; Dunning is a ghost writer and professor of Ancient History at London University, Lionheart works for the Metropolitan Police. Over the course of five stories the two investigators face sinister clowns, Russian demons, an inter-dimensional being and far more, resulting in Lionheart setting up top-secret government department MI-13 in second adventure The Devil of Denge Marsh. There is no doubt that Lionheart is the man who gets things done while Dunning, though obviously very enthusiastic, is not someone to face the darkness alone. And so to The Magic Circle, the sixth adventure in the series. Nicholas Courtney died in early 2011, leaving behind fond memories from a fanbase who dearly loved him and a remarkable career. The decision was made to continue with The Scarifyers, casting seasoned actor David Warner in the role of Harry Crow, Lionheart’s former colleague in the force. The plot for The Magic Circle revolves around Professor Dunning's concerns and search for Lionheart. The tale is both touching and electrifying, oozing humour throughout. Molloy's delivery as Dunning never fails to make me smile, his reaction the perfect treat; in one scene, he clearly fails to realise that there is no such thing as a talking rabbit! Although, I suppose, in the world of the Scarifyers, perhaps it is always a possibility...? Warner, too, hits the mark with an eagle-eye approach and years of police force experience behind Crow. Produced by Cosmic Hobo Productions, The Scarifyers: The Magic Circle is written by Simon Barnard (who produces & directs) and Paul Morris, with music by Edwin Sykes. There is a touch of magic about The Scarifyers and this outing offers an emotional twist in its tale, thanks to the acting talent of Stephen Thorne, who portrays a very special character indeed. And lastly, as an extra treat, a beautiful tribute to Nicholas Courtney from cast and crew: Terry Molloy, Simon Barnard and Paul Morris, David Benson, Lizzie Roper, Ewan Bailey, David Bickerstaff, Scott Brooksbank, Cicely Giddings and Stephen Thorne share their memories of the actor and talk about the story and their characters - includes thoughts about Lionheart from the great man himself! There is no doubt that all involved in this fine production respected and loved Nicholas, and the treatment of his character's memory really does reflect that. Lily Wighton's introduction (played beautifully by Cicely Giddings) is a further lasting tribute to both man and character. I suppose The Magic Circle represents a new phase for the series. Linking up with The Scarifyers at this point makes it easy to join in with the adventures; whereas most audio titles have a story arc that is impossible to absorb the further in they are, now you have an opportunity to enjoy the experience with The Magic Circle or The Nazad Conspiracy (the first in the series). If previous stories are anything like The Magic Circle, you will find them intriguing and extremely good fun, both story lines and wit at the highest level possible, the acting equal to the standards raised by all involved. I am now a fan! #Ghostbusters opens in 130 days.